The goal of the BIH Program is to improve African-American infant and maternal health in California and to decrease Black: White health disparities for women and infants. The revised BIH Program is an intensive intervention that uses a group-based approach with complementary client-centered case management to help women develop life skills, learn strategies for reducing stress, and build social support in the context of a life-course perspective. BIH participants attend weekly group sessions (10 prenatal and 10 postpartum) designed to help them access their own strengths and set health promoting goals for themselves and their babies. 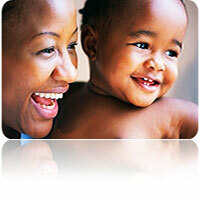 The Black Infant Health Program celebrates Black Maternal Health Week! To learn more about BMHW, visit the Black Mamas Matters Alliance. For information about local BMHW events, including Perinatal Equity Initiative meetings in Pittsburg (4/11), Pleasant Hill (4/12), San Pablo (4/15) and a physician’s conference at Contra Costa Regional Medical Center, call 925-313-6254.
Who is Eligible for BIH? What Services Does BIH Provide? How Can a Woman Access BIH Services? Please call 925-313-6254 or ask your prenatal care provider for a referral to the BIH program.